I made this hat out of a very nice wool blend yarn for my friend Georgia. I modified my “Spark” Slouchy Hat pattern by adding a band and stopping the dome of the hat early so that it would be a closer fit. I’m allergic to wool, but I did not have any difficulties working with the yarn, and the hat worked up fairly quickly. However, when I went to try the hat on, I discovered I was too allergic to wear it. Georgia had no problems with the yarn and was very excited to receive her gift. This hat I made for my friend Kate, who lives far enough away that I had to mail it to her. I originally wanted this hat to be an earflap hat, but I miscalculated how much grey yarn I had, and ran out very early on. 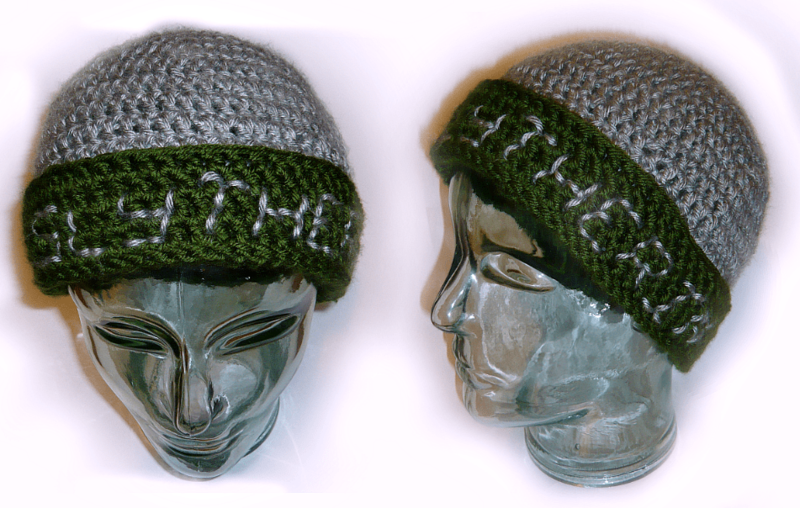 I was able to fix the problem, and made a green brim for the hat instead of earflaps, adding the Hogwarts house name “Slytherin” to the brim in the remaining silver yarn. Over the next few days/weeks I will be uploading pictures of the remaining gifts I have given to my friends, as well as one I received. I will also be taking pictures of older garments that I may not have mentioned before, and posting those. This tie is almost entirely hand-sewn from a green satinette fabric. The tag in back functions to hold the end of the tie in place during wear. Triangular barefoot sandals worked in six skeins of six strand embroidery floss. Made from Gleeful Things’ Goddess Barefoot Sandals pattern. 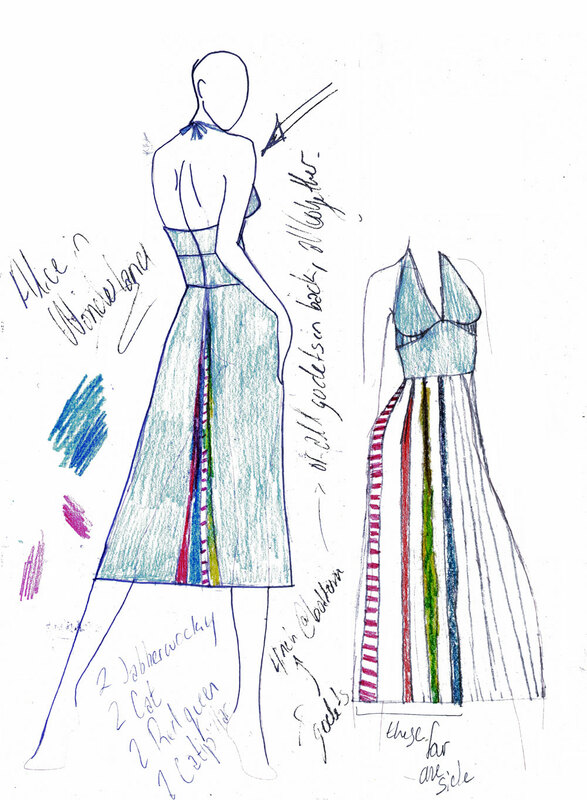 This garment is the “Jabberwocky” dress from the Alice in Wonderland collection. The mermaid-style dress is held up by a hook and eye located on the halter top in the back of the neck. A zipper in the back is added to allow the dress to be taken on and off.